I could start this post in exactly the same way as I began telling you about my lamb meatballs a couple of days ago: the weather always decides what I eat. I finally had a day off work that coincided with day of sunshine, so I made plans to break out the grill and made a big potato salad to launch the start of outdoor dining season. When it comes to making potato salads, I take the same approach I do with pasta salads: the starch to stuff ratio needs to be almost 1:1 and the dressing should (almost always) be a vinaigrette. 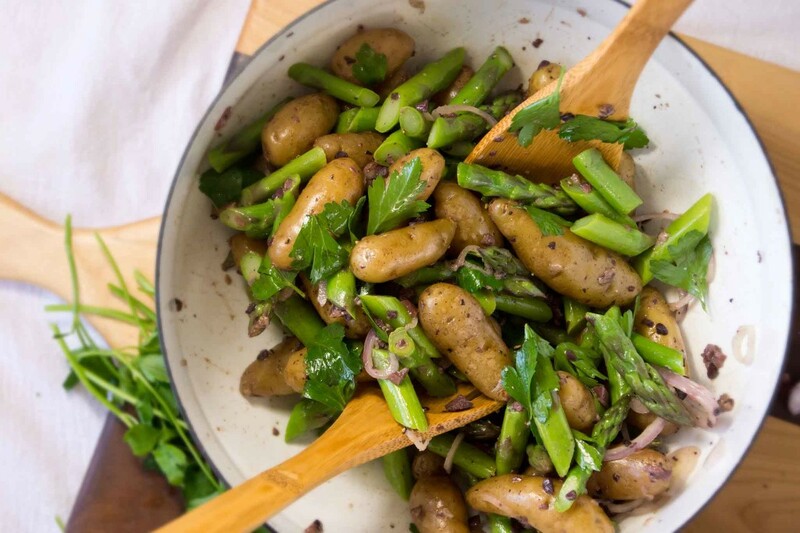 This spring version is made with fingerling potatoes, which I left whole, an entire bunch of asparagus, and a slick of black olive vinaigrette. It’s at its best served a little warm and lovely aside a piece of grilled fish or a steak. It’s no secret, my eating habits are largely dictated by the weather and these meatballs are certainly no exception. Last week, I found myself in my cozy kitchen seeking shelter from a spring slop-storm and immediately scrapped the “oh, I’ll just make a nice healthy salad for dinner” plan I’d originally had and made a big pile of meatballs for dinner instead. And I’ve got to say, these meatballs were worth suffering through the bout of spring slush to experience. 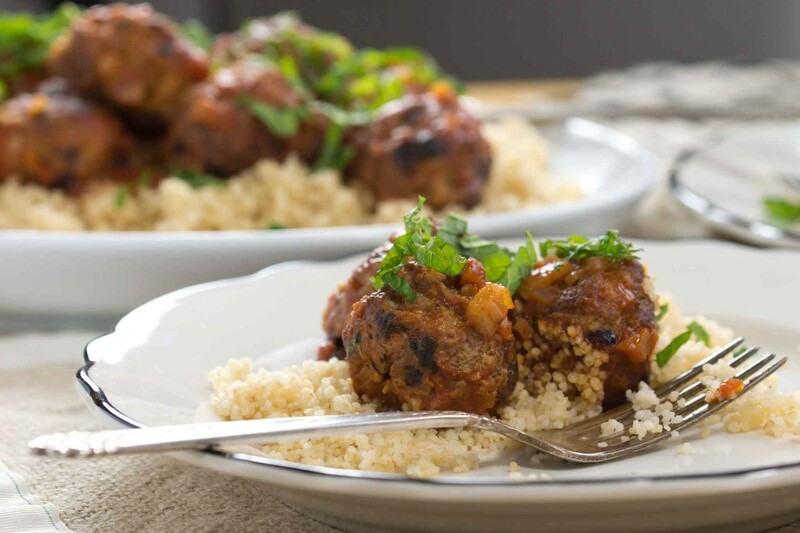 They’re tender and fragrant, spiced with coriander and fennel, that have been simmered in a simple tomato sauce. They’re speckled with black olives, spiked with fresh mint, and just the thing to put on your plate on a rainy night. Growing up, my mother would religiously (pun somewhat intended) boil off a dozen eggs every year on Good Friday. We’d color them, put them in our Easter baskets, and come Monday morning, toss them all in the trash. Well, not quite all–I’d usually work up the courage to try one, gag, and vow to never subject myself to another and one of my brothers would inevitably hide a couple in my closet to be discovered later in the week. Needless to say, we were not a hard-boiled egg family. I thought everyone one like us, I thought everyone realized just how disgusting hard-boiled eggs were. I didn’t realize plenty of people were raised loving egg salad sandwiches and most siblings would fight each over a deviled egg instead of seeing them as something only to be eaten on a dare. A year or two ago, I made a conscious decision to give hard-boiled eggs an honest try. I cracked open my “America’s Test Kitchen” cookbook and taught myself the proper way to boil an egg. I started adding them to salads. At first, I found them challenging. Then I found them satisfying. 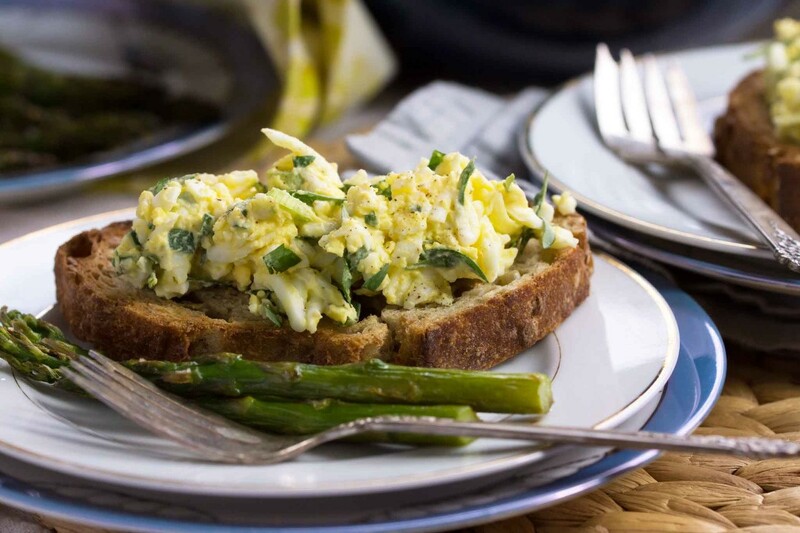 I even started to crave them and, eventually, I came around to what used to be my worst nightmare: egg salad. I’ve been really into brunch the past few weeks. Life has felt a bit frantic lately and carving out time for a leisurely morning meal on the weekends is a good way to make the day at least feel like it’s stretched out in front of you, even if the minute your plate is empty you’ve got to run off and go about other business. 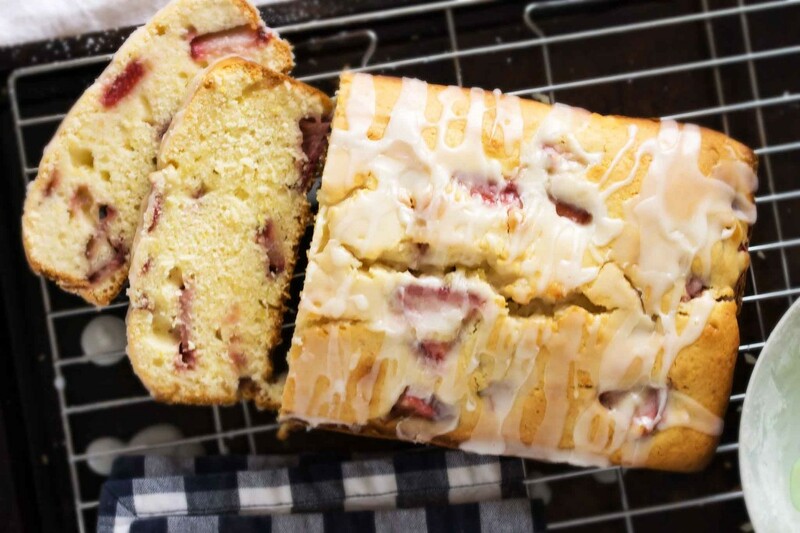 This tart is the latest addition to my brunch repertoire. It’s basically a compact quiche that’s heavy on green vegetables and goat cheese. 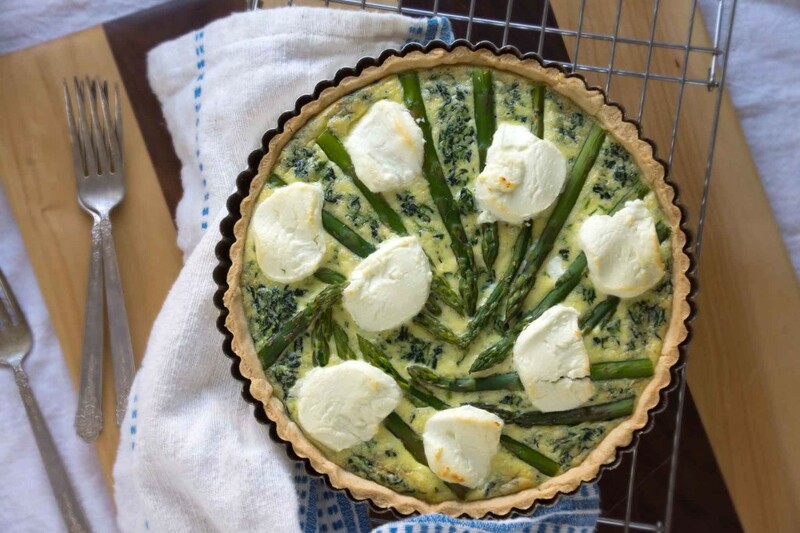 Spinach is whisked into an eggy custard, topped with spears of asparagus and rounds of chèvre, and baked in a flaky crust. It’s a great thing to linger over with a second cup of coffee on a spring morning or, should the weather cooperate, perfect for a patio lunch with a salad and a glass of wine.